Lot Detail - One of the Original Founders of the Brokerage Firm of Dean Whitter. One of the Original Founders of the Brokerage Firm of Dean Whitter. WITTER, Edwin D (1899-1986) one of the original partners in the Dean Witter stock brokerage firm when it was founded in 1924 in San Francisco. Born in Paso Robles, Witter served in the Army in World War I before graduating in 1922 from the University of California, Berkeley, with a degree in business administration. He worked as a securities officer for two years before joining his cousin, Dean, and seven partners in founding the brokerage firm with a single office in San Francisco. After the Depression, the brokerage grew into one of the five largest in the United States, opening more than 370 offices staffed by 8,000 brokers worldwide. 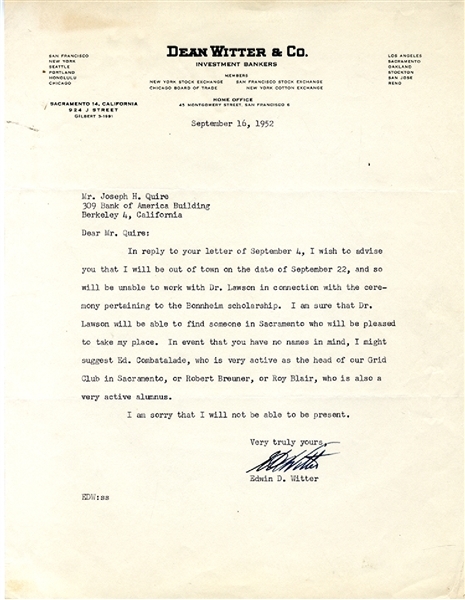 Typed Letter Signed “E(dwin) D. Witter”, 1 page, September 16, 1952 on Dean Witter & Co. letterhead declining an invitation to speak at the ceremony pertaining to the Bonnheim scholorship. Fine. Accompanying is a letter to Witter regarding the scholarship.